Written by Sophia Field, 2018. Full Plate Farm Collective is one of the many local farms that partners with Friendship Donations Network to donate excess produce to community programs serving people in need. In summer 2018, Ithaca’s Full Plate Farm Collective is in its 14th year offering CSAs––Community Supported Agriculture, that is, which provide season subscribers to a weekly bundle of fresh produce, in exchange for an up-front sum which critically supports farms through the harvest season. 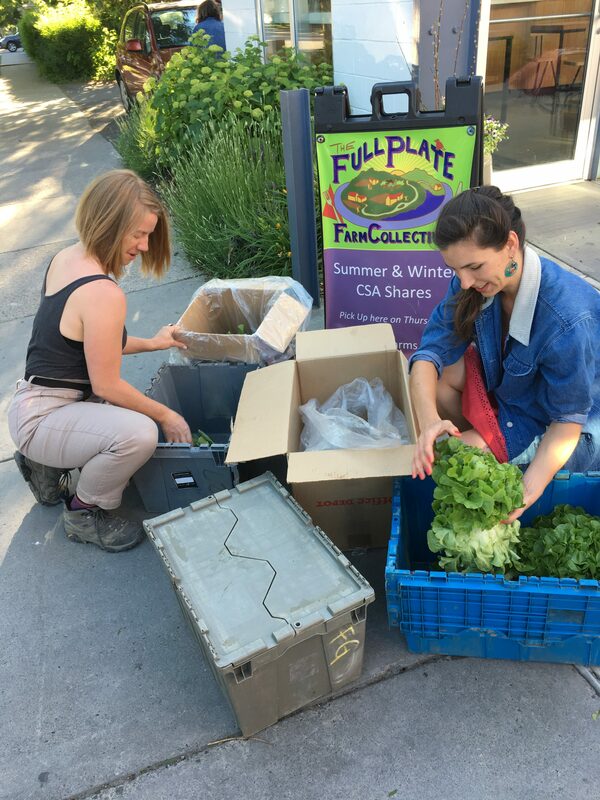 CSA Coordinator Sara Worden is on her seventh summer with Full Plate and hard at work at Press Bay Alley in Ithaca each Thursday evening and organizing box drop-offs at local businesses. Sara describes Full Plate as “a group of farmers and food producers who want to provide great food to the community.” Sara and the Full Plate staff work with Stick and Stone Farm, Remembrance Farm, the Youth Farm Project, Wide Awake Bakery, Crooked Carrot, and Black Pearl Creamery. When I visited Press Bay Alley, I witnessed the abundance of these local businesses coming together –– fresh produce, quarts of local strawberries, loaves of hearty bread from Wide Awake and cartons of fresh ferments from Crooked Carrot. Full Plate’s summer membership is at about 500, with 150 members doing self-service pickup on Thursdays at Press Bay Alley. Others can pick up farmer-selected boxes from several locations, including The Piggery and Cornell campus. Sara also tells me about Healthy Food For All, the Full Plate program that subsidizes CSA shares for low-income families. There are 80 families who receive shares from Full Plate through Healthy Food For All and 200 participants in total. There are also several volunteer spots for those who wish to trade work for a summer share. Currently, they have seven volunteers exchanging hours for fresh produce. Sara appreciates that the work of Full Plate allows farmers to focus on growing great food and mitigating the hassle of getting produce out to consumers. However, there is nearly always an abundance of produce, and perishable foods can’t be stored or re-used. This is where the partnership with Friendship Donations Network is critical. FDN volunteers pick up donations of excess produce at the end of farmer’s markets and CSA distributions. Jena Andres is the FDN volunteer who has been picking up donations from Full Plate Farm Collective at PressBay Alley during the 2017 and 2018 seasons. Jena connected with FDN about 12 years ago when the Northern Light Learning Center was one of FDN’s food distribution partners. As a FDN volunteer, Jena often works with families who do not have a proper kitchen space for food preparation. Full Plate offers more than just Healthy Food For All and their donated CSA produce to get food to the community. They also operate a small, public herb garden in the Fall Creek neighborhood in front of Sue Mueller’s home on the corner of Franklin and Short Streets. Full Plate begins the garden with seedlings each year and the garden is available for community members to access on a take-as-you-need basis. This summer, Sue Mueller is hosting one of FDN’s Neighborhood Food Hubs at that location. Local farmers donated 35,000 pounds of produce to FDN during the 2017 season. Friendship Donations Network is immensely grateful for the partnerships with these local growers, including Full Plate Farm Collective. Photo caption: Sara Worden and Jen Andres pack donations of excess produce for FDN after the CSA distribution.